The FMA3100/3300ST Series will precisely measure flow rates of virtually any clean, dry gas as low as 0.4 to 20 SCCM or as high as 10 to 500 SLPM, including hydrogen. Repeatable results are achieved by utilizing a thermal mass flow measurement sensor design. This proven design minimizes zero drift while maintaining fast response and linear outputs. Compression tube fittings provide fast gas connections and integrate well with existing tubing. The FMA3200/3400ST Series flow controllers will precisely measure and control flow rates of virtually any clean, dry gas as low as 0.4 to 20 SCCM or as high as 0.2 to 10 LPM. 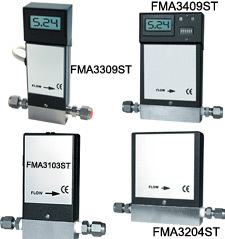 The FMA3200/3400ST Series feature an integrated 3-digit display for flow rate monitoring right on the unit. Electrical connections are made via the included 1 m (3') cable. Either a mating cable (FMA3000C) or power adapter is required. See accessories below. The units are available with or without a display for a wide range of applications. 참고: * For use with power supplies that have terminal connections. † For a NIST certificate add suffix, "NISTAIR" to model number, add $350 to price. All units are calibrated for air at 20/0 psig, unless specified. All calibrations are done at ambient temperature only, 20°C/70°F. Flow ranges are based on dry air or nitrogen as standard. Other gasses available (carbon dioxide, helium, argon, methane, and oxygen) for ranges up to 10 SLM add $150 to price; for ranges 20 to 100 SLM add $250. ** Specify flow controller: Example: FMA3408ST-N2-H2-O2,20/0 $1200 + $150 + $150 = $1500. Comes complete with 1m (3') signal/power cable, and operator's manual. Order power supply with mating connector separately.